We, or rather B, eats a lot of ice cream. And although I LOVE Ice Cream I haven’t been eating it because of the sugar. I take small bites of everything I make/bake that contains sugar just to test/taste but that is it. So when I made this ice cream I used 1/3 of the sugar and finished the rest with Splenda. It’s a compromise, but I feel better about making it that way. 1. Pour the cream and milk into a medium-sized stainless steal bowl and place over a steaming pan of boiling water. 2. While the mix is scalding, cut the vanilla beans in half lengthwise and scrape out the seeds with a spoon. Add the pods and seeds and sugar/Splenda mix to hot milk and seep for about 5 minutes stirring occasionally to mix in the sugar. Remove pods from mix. 2. Remove bowl from heat and slowly stir in 1/2 cup of Peanut Butter until mix is completely smooth. Add corn syrup. 3. Chill mixture in the fridge until cool (or overnight for a fuller flavor). 4. Pour mix into an ice cream maker and process according to the manufacturer’s instructions. 5. Transfer to a bowl and quickly swirl in remaining 1⁄2 cup peanut butter, cover, and freeze until hard. 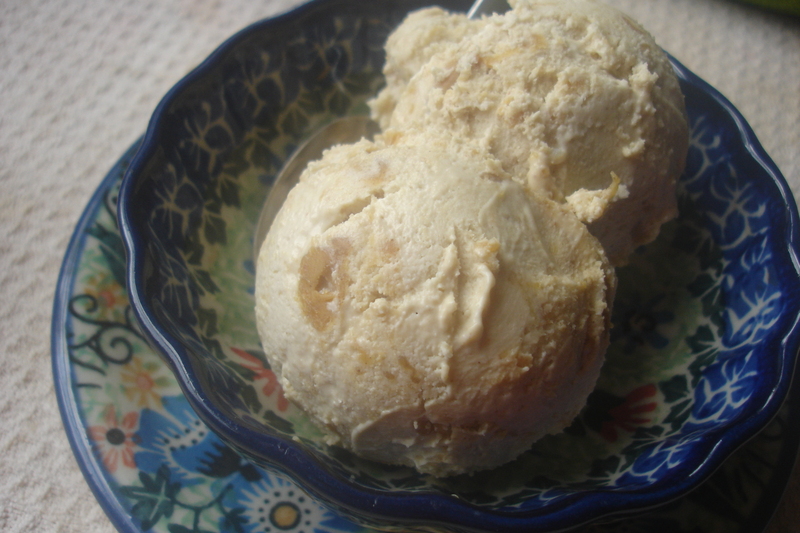 By waiting until after the ice cream is churned and adding the PB you end up with large swirls of PB. When I was little I remember traveling with my parents and/or grandparents and stopping pretty regularly at Howard Johnson’s Cafeteria. Back then it wasn’t a motel and eatery, it was just a simple diner. I always got the same exact meal – fried clams, which HoJo’s back then was famous for, and a scoop of Coconut Ice Cream. It was rich, full of flavor and full of coconut. There were 28 flavors then. I didn’t care. I ALWAYS got coconut!! I have been trying for a long time to replicate what I remember as that ice cream and I think I have finally done it thanks to Jeff Key’s Ice Cream Mix-ins. consistency, but don’t let it get too warm. Using the empty Coco Lopez can, first measure % can of whipping cream and add to the coconut cream, then 1/2 can of milk and add into the coconut cream. Pour the mix into an ice cream maker and process according to manufacturer’s instructions. Just before the ice cream is finished processing, add the coconut flakes. 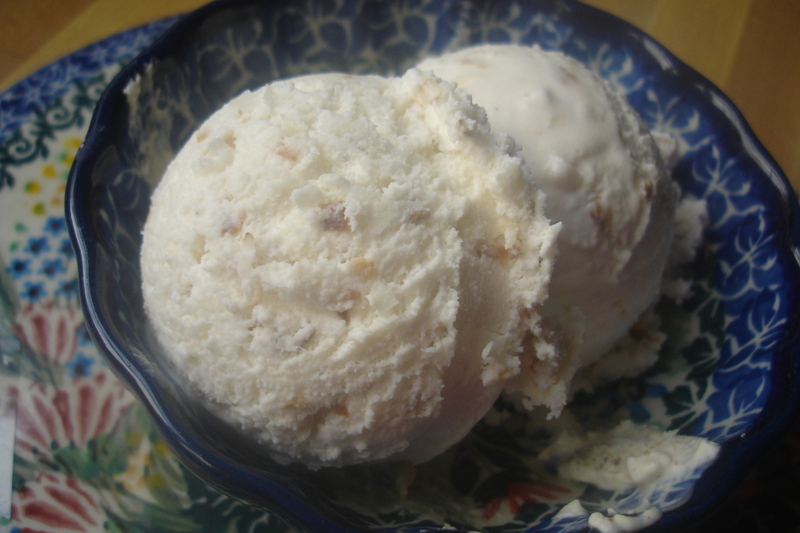 Scoop the ice cream into a container and place in freezer to cure and harden. This is definitely one of my favorite ice creams. And so very easy to make using the cream of coconut which makes it rich and thick and very flavorful. Because of my Friend Leslie I have discovered Penseys. If you aren’t familiar with Penzeys it is a Spice Outlet. It carries so many spices. Some I haven’t heard of. Some I am just now familiar with. Included in the catalog and on-line are some awesome recipes. Desserts, sides, poultry, beef. You name it there are recipes for it – four years worth. And in the Summer 2012 catalog was this one. 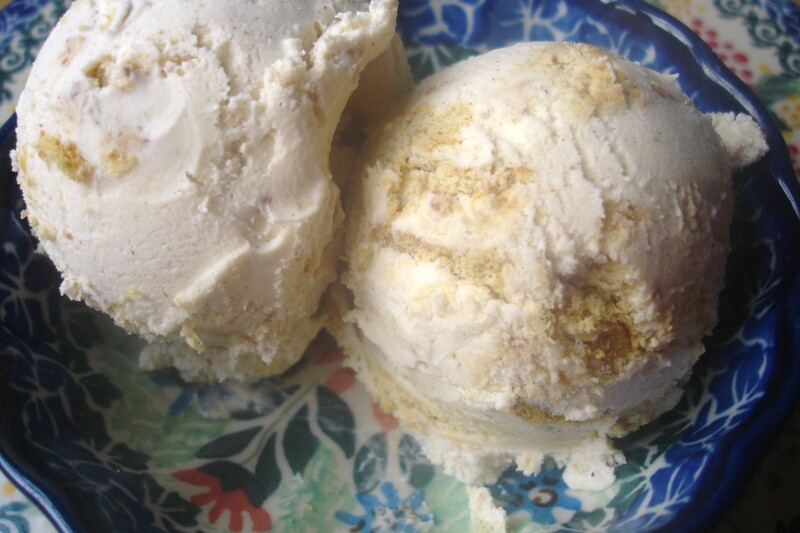 Cinnamon Graham Cracker Ice Cream. Beat the heavy cream in a large bowl until thick (2-3 minutes). Fold in the yogurt, VANILLA, honey, maple syrup and CINNAMON. Add the remaining ingredients a couple of minutes before the ice cream is fully thickened. Pour into a l 1/2-quart freezer-safe bowl with a lid and chill until hardened. If you don’t have an ice cream maker, you can put the original mixture into the freezer-safe bowl and freeze for 2 hours. Then, stir the mixture and add the graham cracker and toffee bits. Continue to stir it every 2 hours, for up to 6 hours. Then, chill until hardened. Add this one to your Ice Cream Line-up! Good stuff! !